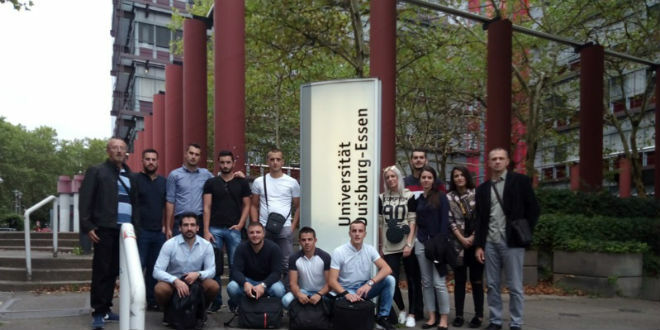 Within the framework of the programme ERASMUS + REBUS project (REady for BUSiness – Integrating and Validating Practical Entrepreneurship Skills in Engineering and ICT Studies), students of the Faculty of Mechanical Engineering of the University of East Sarajevo visited the University Duisburg-Essen in Germany. Twelve students and two professors, together with colleagues from the region and Europe, attended trainings performed by eminent lecturers from the University of Duisburg-Essen in the field of entrepreneurship in the period from 29.08.2018. to 08.09.2018. The aim of the training was to train students for independent business plans, as well as to promote entrepreneurial competencies as key competencies for future engineers’ employment, which is the goal of this project. The project includes fifteen partners from the region and Europe. The Project Coordinator on behalf of the University of East Sarajevo is Dr Goran Orasanin, Ph.D.